It’s becoming an annual tradition in Los Angeles – just as last year, the Cinefamily/Silent Movie Theatre on Fairfax Ave. is running the classic Lou Bunin stop motion/live action Alice In Wonderland. 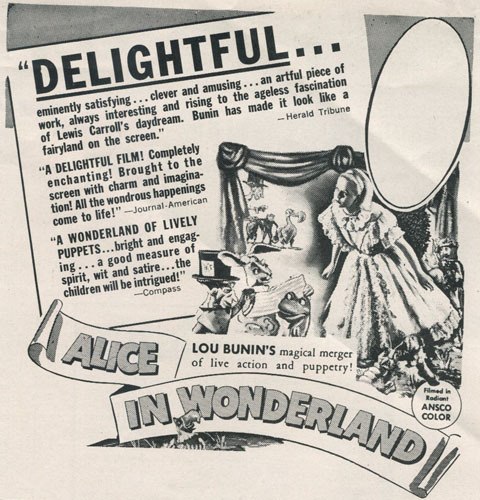 Made in 1949, but released in 1951, the film was originally suppressed by Disney for fear of its potential upstaging of their own animated Alice. This rare showing of the beautiful MOMA-restored 35mm print will screen Saturday night at 5pm and 7:30pm. For advance tickets, a clip from the film and more info, click here. This entry was written by kelvin, posted on November 27, 2009 at 5:30 am, filed under Animation. Bookmark the permalink. Follow any comments here with the RSS feed for this post. Trackbacks are closed, but you can post a comment.